As Common Core failed to fully integrate itself into the classrooms of LAUSD over the past few years, the results from the last Smarter Balance test came to University High parents, students and staff as a shock. At a statewide level, 44 percent of students who took the test met or exceeded the standards for English Language Arts. Only a third of the students met or exceeded the standards for math. Out of the 396 students tested at University High, only 13 percent were deemed college ready, and even fewer, 2 percent of students, were considered college ready for math. The results were so strikingly low throughout all schools in the district and throughout the state that the state has decided to disregard the scores. These drastically low percentages have provoked parents and authorities alike to question who is to blame: the students, the teachers or the test itself. In addition to the new standards, the format of the test has changed drastically as well. Questions become increasingly or decreasingly difficult based on which questions a student answers correctly. It is no longer simply multiple choice; each question requires a higher level of thinking. No two students are supposed to encounter exactly the same questions; instead the test is designed to follow the academic level of each individual student. However, students faced numerous problems with this Smarter Balance test. “I feel that some of the content on the test did not match what we had learned inside the classroom,” senior Mayte Gonzalez said. As testing day arrived, just prior to AP exams, students were not prepared nor was the significance of the test emphasized. As a result, most students might not have demonstrated their true potential. Other issues arose with the new media format and length of the test. They were administered electronically for the first time, and many students faced problems logging on successfully or had difficulty figuring out the new system. With the test lasting approximately 7 to 8 hours in total, many students lost focus and abandoned any chance of succeeding on the test. 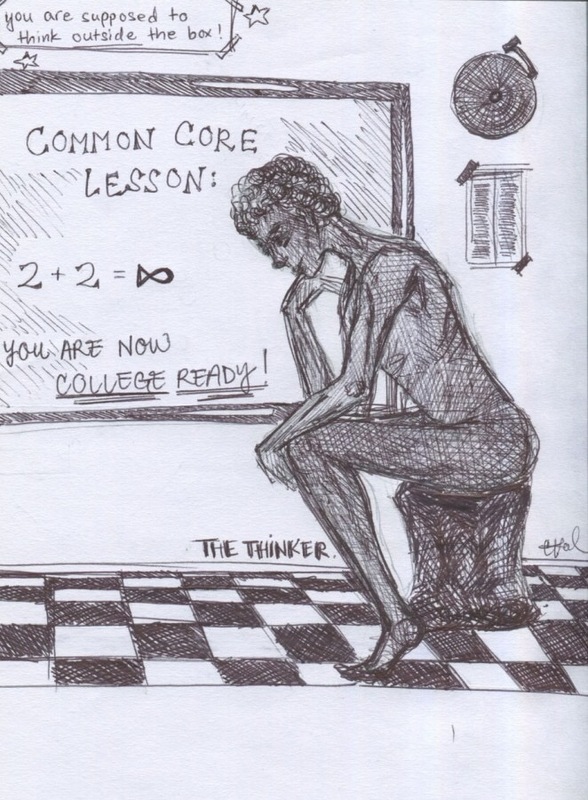 More problems arose with students who took AP English or Math courses in which the new Common Core didn’t yet apply. The College Board is in the midst of revising many of the AP exams to link up with the Common Core. However, the Common Core math sequence is best suited to prepare students for AP statistics or AP computer science, which leaves AP calculus out of the picture. Many schools that follow the Common Core rigidly might soon replace AP calculus with a course such as AP Algebra, which is more suited to the curriculum. On the other hand, parents and administrators alike are worried whether these scores accurately reflect the students’ abilities and what measures can be taken to correct the curriculum and/or the test. Due to Noehmi Garcia’s leave of absence during last year’s testing time, Nathaniel Rock, the Title I coordinatior, took over the administration of the test. The school was short a few dozen computers and a couple of classrooms had to use iPads for the test. Additionally, Rock claims that there was a glitch in the testing system after reviewing the results and discovered the system reported many students did not complete the tests although they were checked thoroughly for completion before they were submitted. The majority of teachers believe that this testing system has potential to better evaluate individual students in the future, but at the moment Common Core is not at its full potential. This new curriculum has required teachers to alter their course outlines and create all new lesson plans incorporating these higher-level standards. Teachers with more than one subject have been faced with a copious amount of work as they try to reorganize their teaching methods. Before the current Smarter Balance test, the California Standardized Test (CST), assessed the California content standards in English Language Arts, mathematics, science, and history-social science. These tests focused on evaluating the school’s ability to teach rather than the intellectual capabilities of individual students. Along with the CST’s, the API scoring system received the hatchet. The new system-in-the-making is being referred to as the SQUII. The newest edition to this school evaluation is that academics only compose 60 percent of the score, with the other 40 percent based on the social-emotional and culture-climate of students. Students and teachers alike are struggling to adapt to the new and more challenging standards of the core testing. With time, it is predicted that scores will improve as the new system is better incorporated into the curriculum and the testing is more universally comprehensible.